Sircon Review 2019: Is Sircon a Good Hosting? Norwegian web host Sircon offers a simple set of hosting plans that run on 100% renewable energy and come with or without WordPress pre-installed. Sircon Norge AS (or simply Sircon) is a web development and hosting company based in Trondheim, Norway. This vendor is proud of the fact that it runs on 100% renewable energy, and its unique selling proposition is the preinstallation of WordPress (with a responsive theme) for free. The Sircon website can be switched between the Norwegian and English languages. Sircon offers web design and development, domain registration, VPS, and “web hotel” shared hosting services. The simple set of five hosting plans comprise STARTER (500 MB storage, 20 GB traffic), MINI (5 GB storage, 200 GB traffic), MIDI (10 GB storage, 200 GB traffic), LARGE (20 GB storage, 300 GB traffic), and PRO (50 GB storage, unlimited traffic). You will notice that none of the plans provide unlimited storage and only the PRO plan offers unlimited traffic. One of Sircon’s FAQs, titled “Why do you not offer unlimited bandwidth?”, explains that unlimited resources are never truly unlimited and that 95% of its users use less than 5 GB per month. The hosting plans come with the WordPress CMS preinstalled for free if you choose this option at the checkout. You also get a responsive WordPress theme for free. If shared hosting is not for you, or you’re ready to scale, Sircon allows you to purchase a fully customizable virtual private server (VPS) with 50 GB to 10,000 GB storage, 512 MB to 30,720 MB memory, 100 GB to 5,000 GB traffic, and the Ubuntu Linux operating system. Sircon makes a big deal about the fact that all servers and cooling systems at its Norwegian data center run on 100% renewable energy, and the residual heat from servers is used to heat the company’s offices. Although there is no uptime guarantee, customer services confirmed an anticipated uptime of 99.97% thanks to the 24/7 monitoring of servers that have redundant power and internet connections. Sircon’s prices appear to be reasonable for a Scandinavian hosting provider, and of course– the more you pay, the more resources you get. Domain registration costs extra, but you do get an SSL certificate for free and (optionally) a themed WordPress installation for free. Beware that while the base prices might look reasonable enough, many additional paid services could bump up the base price. There is a separate pay-for SLA, and the price list also provides prices for database and web hosting account recoveries. So while daily backups are done for free, you have to pay to have them restored, but you also have the option of backing up manually from the cPanel control panel. Although Sircon displays prices-per-month for illustration and comparison purposes, you can only purchase plans on an annual basis at the checkout. All domain registration and hosting orders are binding, save for the fact that individuals have a 10-day right of withdrawal. At the end of the initial period, you have a 30-day window to cancel your annual hosting and avoid being charged for another year. You can support yourself via the surprisingly useful FAQ-style support page, once you realize that it’s better to choose from the listed support categories than to try initiating a search. 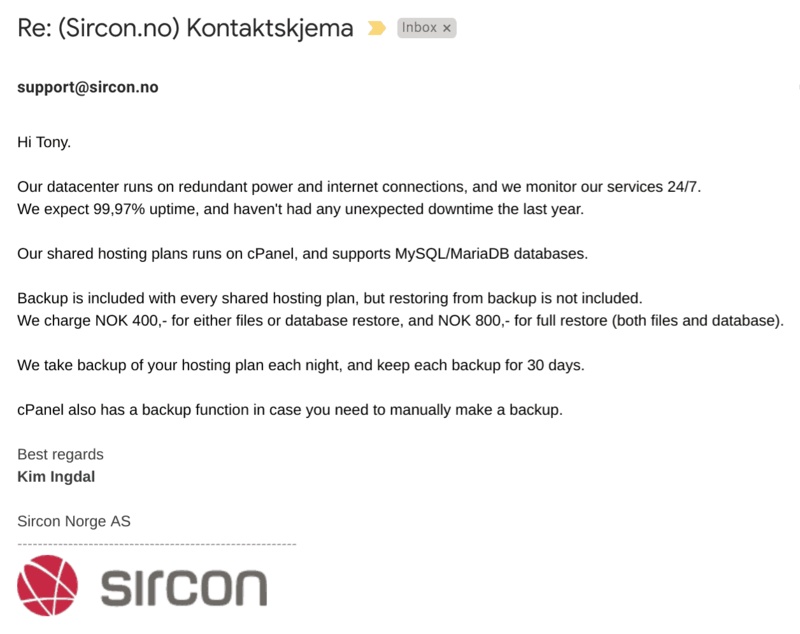 Sircon offers a nice set of shared hosting plans from its nice looking website. If you want to work with WordPress and you want to save the planet, this vendor might have something that appeals uniquely to you. Otherwise, you might be put off by the inflexible payment terms. Wondering how Sircon stacks up against other Web Hosting companies? Enter any other Web Hosting company and we will give you a side-by-side comparison.